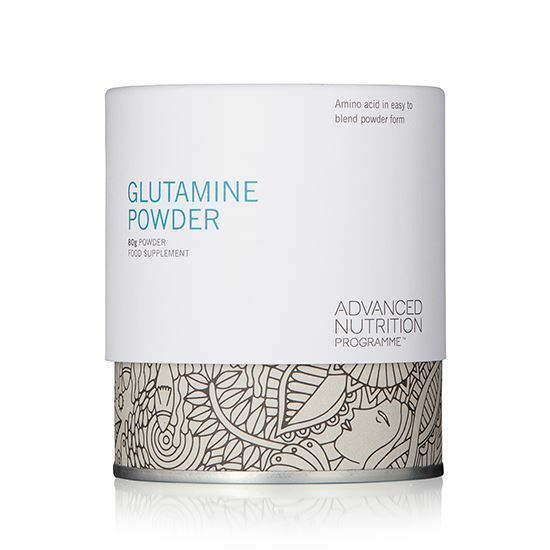 GLUTAMINE | iiaa Ltd | The UK and Ireland distributor of Environ Skincare, jane iredale makeup and Advanced Nutrition Programme. DOES NOT CONTAIN: sugar, salt, starch, soya, wheat, gluten containing ingredients, maize, corn, yeast, lactose, dairy products, artificial preservatives, colours or flavourings. Take between ¼ teaspoon (900mg) and 1¼ level teaspoons (4.5g). Children over 8 years, ¼ teaspoon; over 10 years, as adults) 1-3 times a day, between or before meals, or as your health professional advises. Do not exceed recommended daily intake. Stir into cold water or juice and drink immediately, or for children can be sprinkled onto cold food.